I suppose I should give a lot of credit to the beautiful weather we've been having here in Boston, but I have been feeling really optimistic lately! This past weekend I aimed to be more productive, but also more relaxed. I consciously avoided the TV more, spent more time reading (more on this later), indulged without over-indulging (except those Jolly Rancher Bites I desperately inhaled during my allergy/sinus flare-up on Friday - pshh I'm human! ), and even did 2 hours of yoga back-to-back on Sunday. I feel strong! I feel flexible! I feel...I feel...I feel...I feel happy of myself! (This video is a MUST watch, my husband and I can't stop quoting this little nugget.) I'm trying to develop better habits overall - I want to improve my flexibility/strength/body, improve my mind, and improve my eating habits. You may have noticed, if you follow me on Instagram, that I've been posting more photos of foods that I cook/create at home. I recognize this may be the equivalent of seeing your friends post photos of their amazing life and how great they're doing and how their child is the best child ever and yada yada....but what I've found is that by posting these healthy creations, I feel like I'm being held accountable for my diet. I feel like I am being held accountable for maintaining a healthier lifestyle, as well. It's super motivating! I certainly get excited when people comment or like my photos, but the pleasure for me comes out of putting it out there, what I created and took the time to make. For this Wellness Wednesday, maybe try to take these kinds of moments more. Step away from the iPhone, iPad, MacBook, SmartTV, and be present. Read one of those books that's been sitting by your bed. Organize a junk drawer. Cook a healthy meal and totally boast that sh*t on social media. Go for a walk, even if it's only around the block. In doing any of the above, I've found that I feel a huge sense of accomplishment and productivity - something a coworker and I were discussing earlier today. No matter what size the accomplishment is, I acknowledge it and it keeps me feeling more positive, motivated to continue to wisely utilize every precious minute of each precious day to it's fullest. Those little moments of productivity add up and boost those happy fuzzy feelings. Wouldn't you rather feel fulfilled and present, versus unproductive, lazy and lethargic? Work within your limits, start small, and see how you feel. My husband and I share many interests, one major one being a love of sloths. They're our favorite animals, next to cats! I remember when we first starting dating (nearly 11 years ago!) how excited we both were that sloths were our favorite animals. I was sold, haha. I was so excited when I saw on Instagram that American Apparel had teamed up with one of my favorite people, Todd Selby, to create this adorable t-shirt; 30 percent of it's proceeds go towards the incredible Sloth Sanctuary of Costa Rica! I bought my husband one, and am thinking of getting myself one to add to a future t-shirt quilt. Buy and support little sloth loves here. Some of you may know that I maintained a [mostly] vegan diet from 2007-2010. I was in college, feeling super cool and unique, and had subjected myself to the violent real-life horrors of "Meet Your Meat"...I still can't even look at Alec Baldwin the same, even today. Anyway, I had always wanted to kitchen gadgets but never purchased them - one being a tofu press, which, when you have loose bricks all over your city, becomes a pretty pointless purchase. 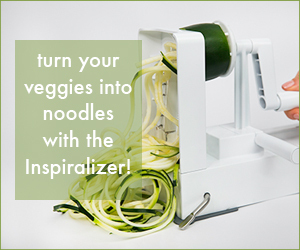 The second was a coveted spiralizer, now made famous and omnivore-friendly by Ali Maffucci, the creator of Inspiralized. Recently Sur La Table was having a sale on their own version of a spiralizer, née the Spiral Slicer, so naturally I needed to fulfill my former vegan self's desires and purchase one. $26 dollars later I felt so proud when I came home and showed my husband the purchase (they retail for like $35 and up, people!). That evening I prepared my first spiraled meal and it was delicious!! I was so satisfied and didn't even miss pasta. Snoodles for the win! I simply spiral sliced one large zucchini, tossed it with fresh lemon juice, salt, pepper, granulated dried garlic, dried basil, a little bit of parmesan cheese, capers, olive oil, and a splash of garlic oil. We also grilled chicken breast that had marinated in balsamic vinegar and lemon juice. It was delicious! The noodles, when eaten raw, have a slight crunch. We nuked ours for a little in the microwave and they still maintained that crunch when warm. I'm looking forward to making some more dishes with our spiral slicer, but feel a little too intimidated to branch out to, say, a sweet potato. Time to scour Pinterest, I suppose!